After a car, two plane, a bus and another car ride, I’m here! All in all, the trip went pretty smoothly. I hadn’t flown on a large international plane in awhile, so it was nice to get a hot meal, even if it was a block of tofu (Gordon Ramsey, could you please add some life to vegetarian plain plane food? I watched two movies, Wolfman, a regret, and Valentine’s Day, which I enjoyed and appreciated for its million different plots that kept me occupied during the flight. I had an hour layover in Dublin then another 2.75-hour flight to Rome. The bus from Rome to Perugia was the trickiest obstacle. I dragged my luggage back and forth the Fiumicino airport parking lot for about 20 minutes asking people where to find the Sulga bus. Everyone said just wander around until you find it; it could be anywhere. Great system you have here. I nearly gave up this search to instead find a way to get to Rome’s Termini train station, but then the bus pulled in. Other people obviously knew where to wait because a bunch of priests were gathered in one spot to hop on. I don’t recall a sign. Anyway, we boarded, paid our 21 euro and took off within five minutes. 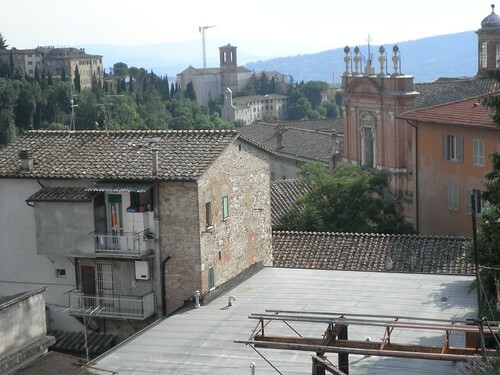 Three and a half hours later I arrived in Perugia. I could not find a taxi at the bus station, so I used a stranger’s cell to call my landlord and she and her son came and picked me up. Though I haven’t slept since Friday night, I forced myself to go for a walk and check out the city. Inexplicably, I didn’t bring my camera to capture the gorgeous architecture, so for now you’ll have to settle for the view outside my bathroom window. In addition to pizza and a few groceries, while I was out I bought The Devil Wears Prada and The Blind Side DVDs in Italian and an Italian/English dictionary. I was hoping to use my Kindle to look up words in class, but I realize now that e-readers (or at least Kindles) are kind of worthless for dictionary or travel guide use. For now, they’re better for just straight up novel reading. I was kind of nervous before I took off for Italy, but once I landed here, I felt fine. I realized, “Oh, yeah. This is all so familiar.” And I’ve already had numerous conversations in Italian and they’ve gone better than any of the ones on my previous trips. OK, time for a shower! And soon bed. Glorious bed. I’ve been falling asleep as I’ve been writing this, so hopefully it makes a little sense.